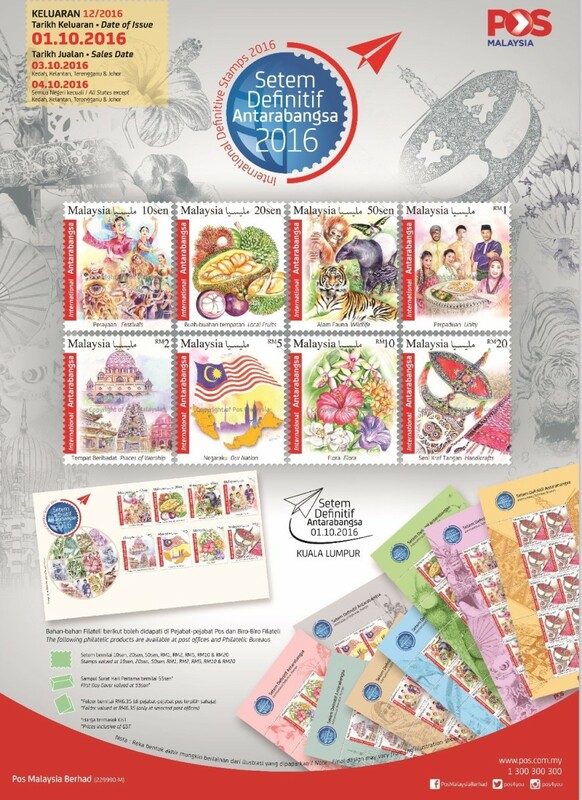 Just like the books of records by various parties, this start out as a sharing of firsts in the Malaysian Philately. I thought it would be fun to just record down and update the “firsts” as we go along. I had to scope down a bit or else we might need to go very far back into Straits Settlements and beyond to find some “firsts”. I will also add in some “Lasts” when that is appropriate. Feel free to add in, there is always an interesting piece of knowledge out there…. 1. First Malaysia stamp issue! Well, definitely the Formation of Malaysia on 16 September 1963! 2. 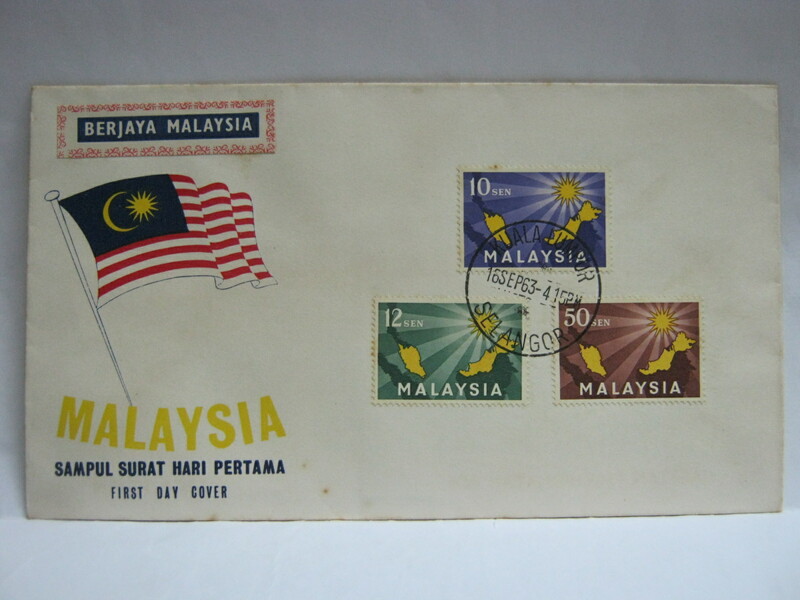 Incidentally the Formation of Malaysia official FDC also became the first with an error and had to have a “Berjaya Malaysia” sticker to stick over the date of formation which was changed to 16 September 1963 (from the original proposal of 31 August 1963)! 3. 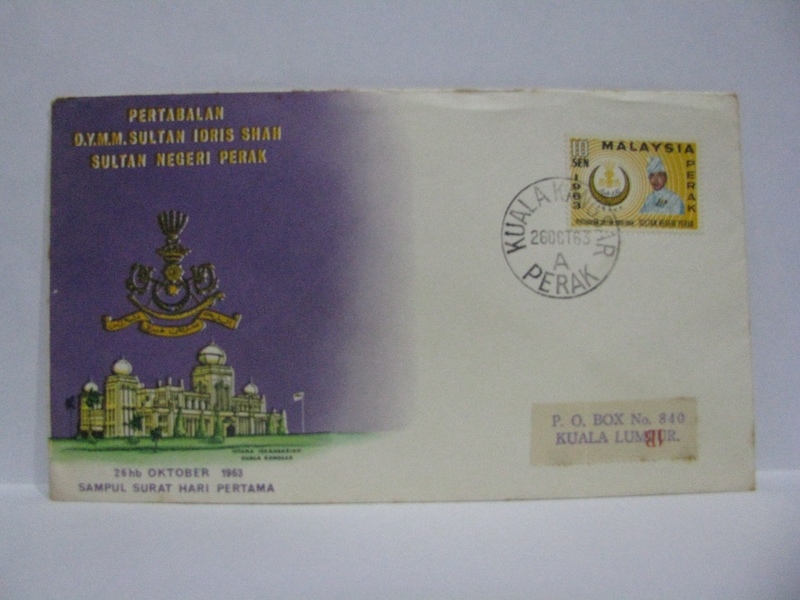 The first royalty issue in Malaysia is the Installation of DYMM the Sultan of Perak on 26 October 1963. 4. 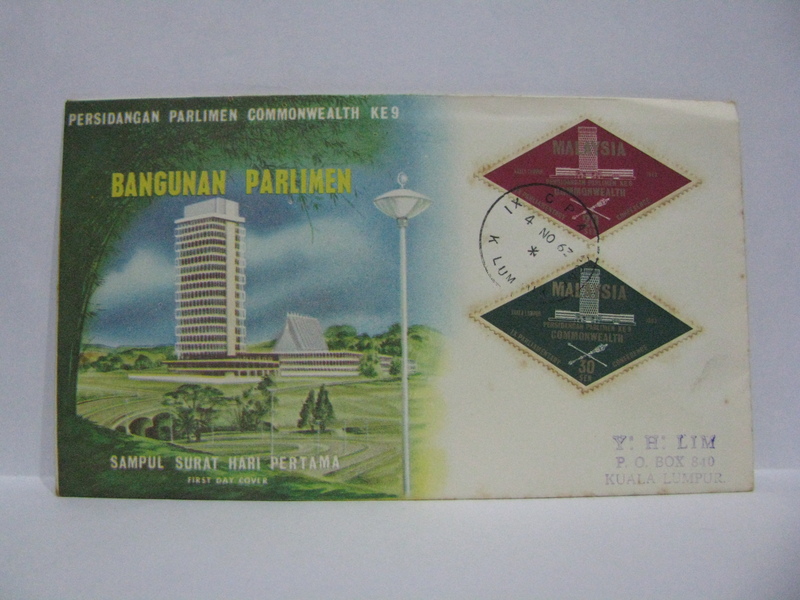 The first special cancellation was used on 04 November 1963 for the 9th Commonwealth Parliamentary Conference. 5. The first odd shaped stamp is also the 9th Commonwealth Parliamentary Conference issue. 6. 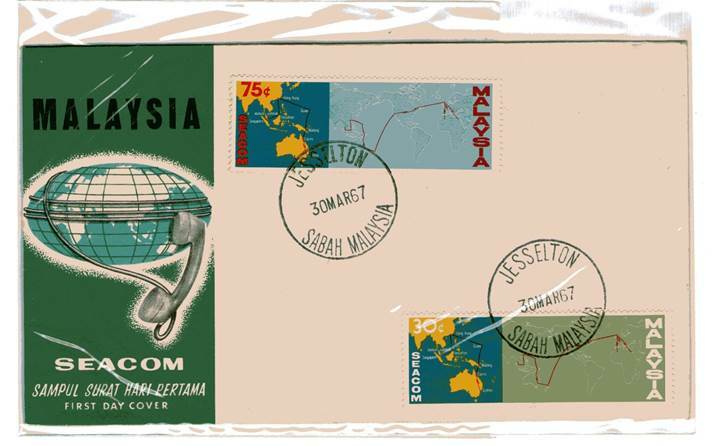 The first overprint stamps was issued on 01 July 1964 on the Sabah Definitive. 7. The first universal theme was Eleanor Roosevelt Commemoration on 10 October 1964. Many other countries issued stamps on this theme. However it is not an Omnibus Issue. 8. 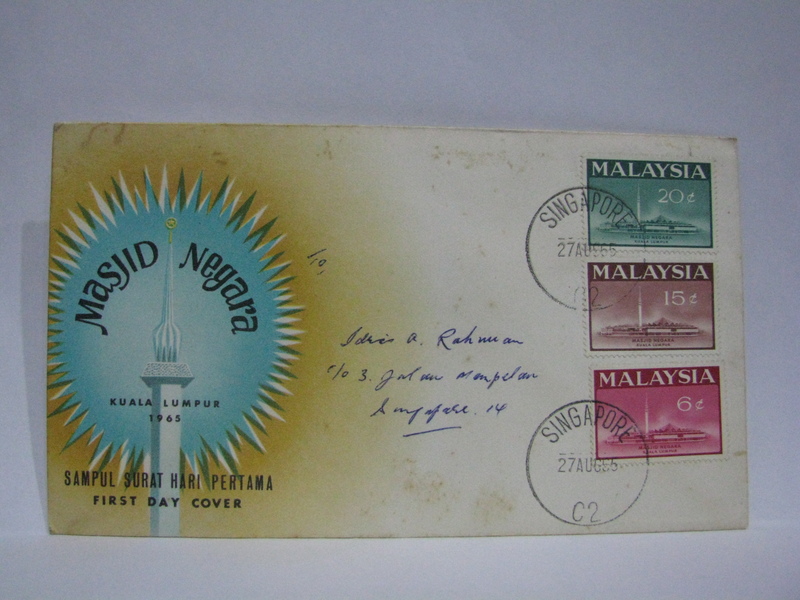 The first recorded minor error on the stamp is on 27 August 1965 on the Opening of the National Mosque 15 cent stamp with a minaret spot. 9. The first Malaysia First Day Cover still valid to be cancelled in Singapore after the separation is also the Opening of the National Mosque. 10. The first National Definitive was issued on 09 September 1965. 11. The first State Definitive was issued on 15 November 1965. 12. 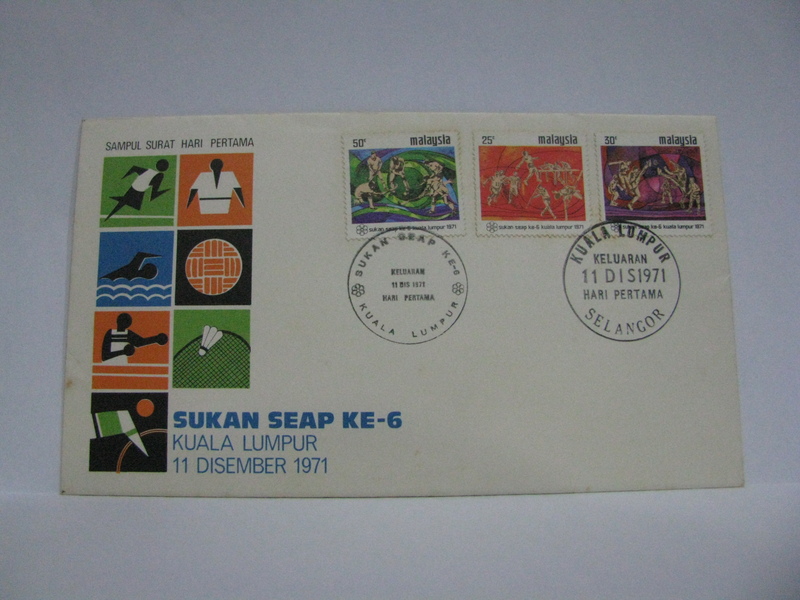 The first slogan cancellation on First Day Cover is on 14 December 1965 for the 3rd SEAP Games. This image is from Richard Cheong. 13. The first postcard was issued in 1965. However, I do not have the first date of issue. 14. The first Pre-Stamped Envelope was also issued in 1965. I do not know the date of issue. 15. The first aerogramme was issued in 1966. Again, I do not have the first date of issue. 16. 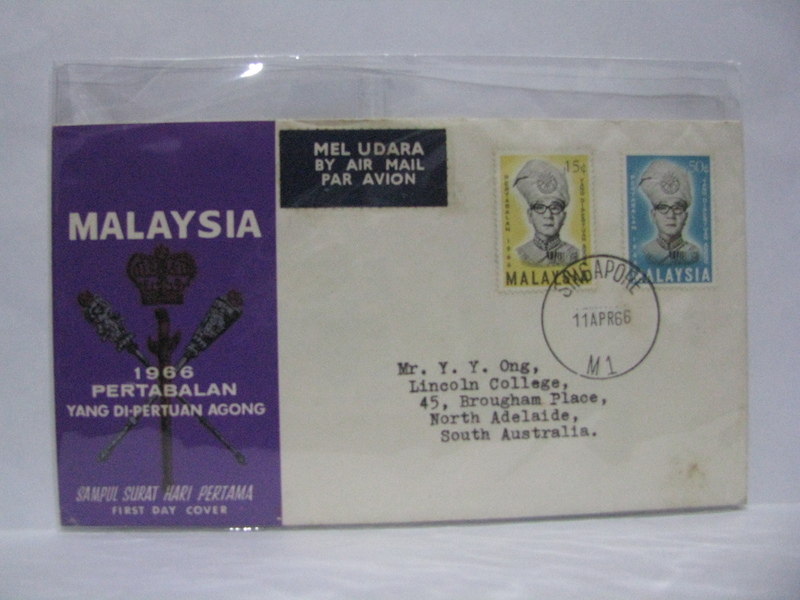 The first Installation of DYMM Yang Di-Pertuan Agong stamps was issued on 11 April 1966. 17. The first postage due stamps were issued on 15 August 1966. 18. 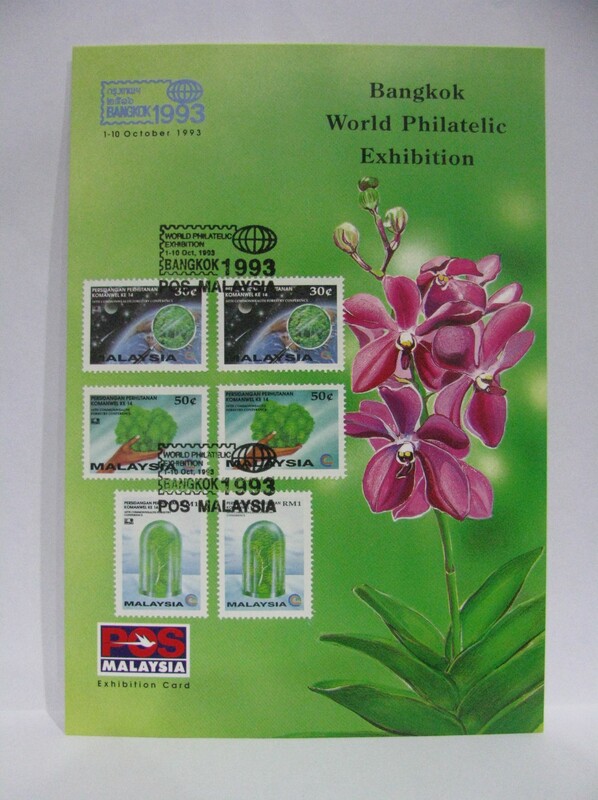 The first official exhibition cover was issued on 17 August 1966 for the Penang Post Office Philatelic Exhibition. 19. 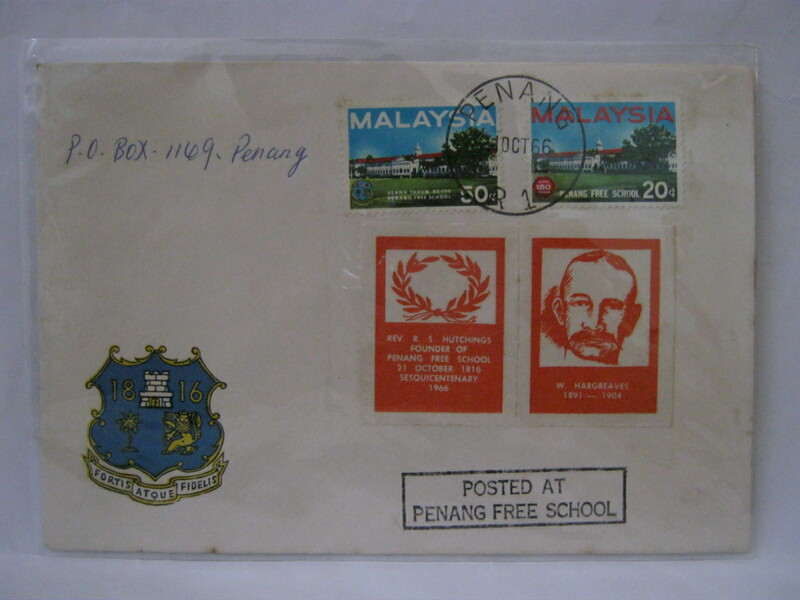 The first cachet was used 0n 21 October 1966 for the Penang Free School Sesquicentenary. The cachet was “Posted at Penang Free School”. On 21 October 2016, the Malaysia Book of Records recognised this as the “First School to be issued a Commemorative Stamp”. 20. 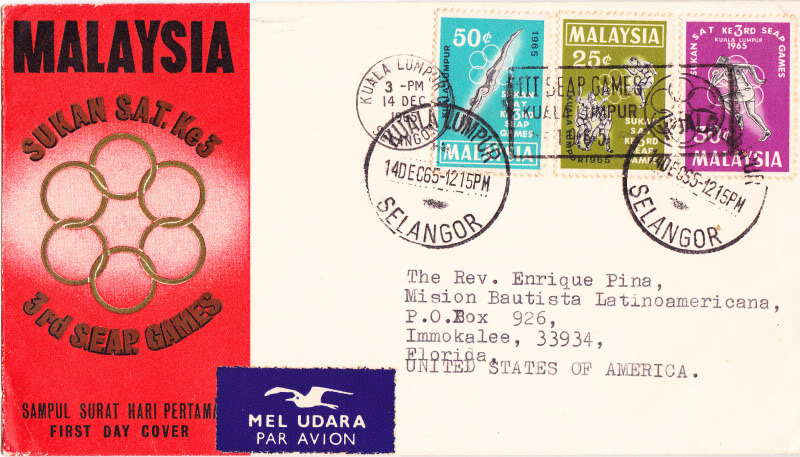 The last time that Malaysia First Day Cover cancelled in Singapore is on 01 December 1966 for the Malaysia Plan issue. 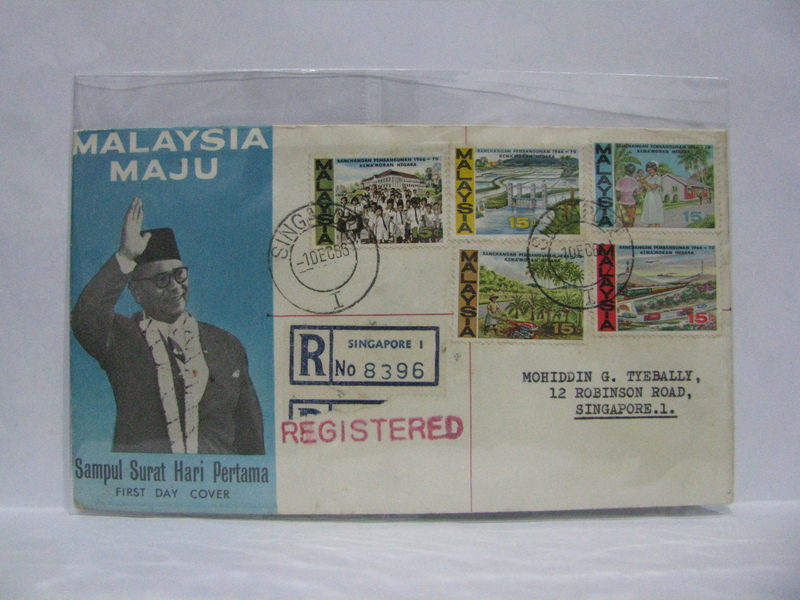 Note: The last Singapore First Day Cover cancelled in Malaysia is on 09 August 1966 for the First Anniversary of the National Day issue. 21. 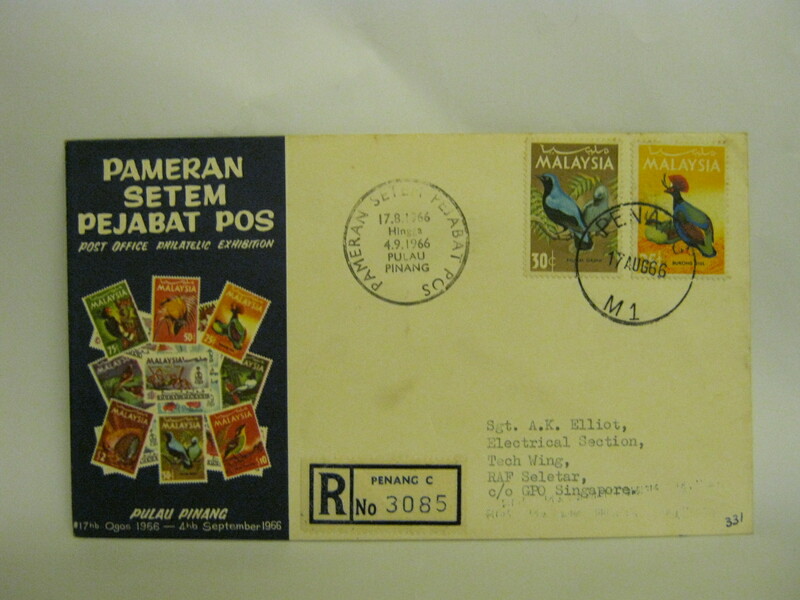 The first use of the Keluaran Hari Pertama cancellation was on 30 March 1967 for the SEACOM issue. This image is from KH Chung. 22. 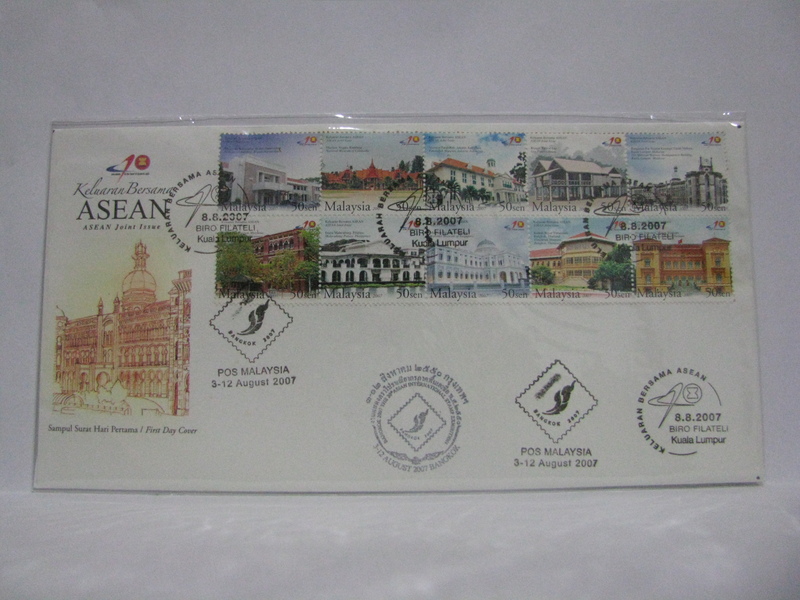 The first setenant stamps were issued on 18 September 1971 for the Visit ASEAN Year. 23. 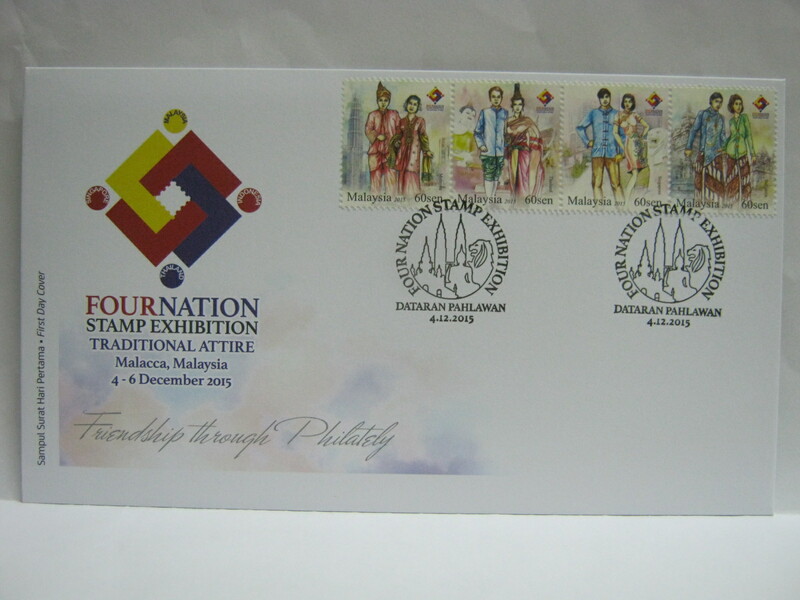 The first pictorial cancellation was used on 11 December 1971 for the 6th SEAP Games. 24. The first definitive stamp booklets were issued on 08 December 1973 for the Butterfly Definitive series. 25. The first cancellation error (postmark error) was on 01 February 1974 for th Establishment of the Federal Territory. The word Selangor was found on the official cancellation. 26. The first coil stamps were issued on 19th January 1976 for the Butterfly Definitive series. 27. The first gutter pair was issued on 15 March 1978 for the 2nd Board of Governers Meeting of the Islamic Development Bank. 28. 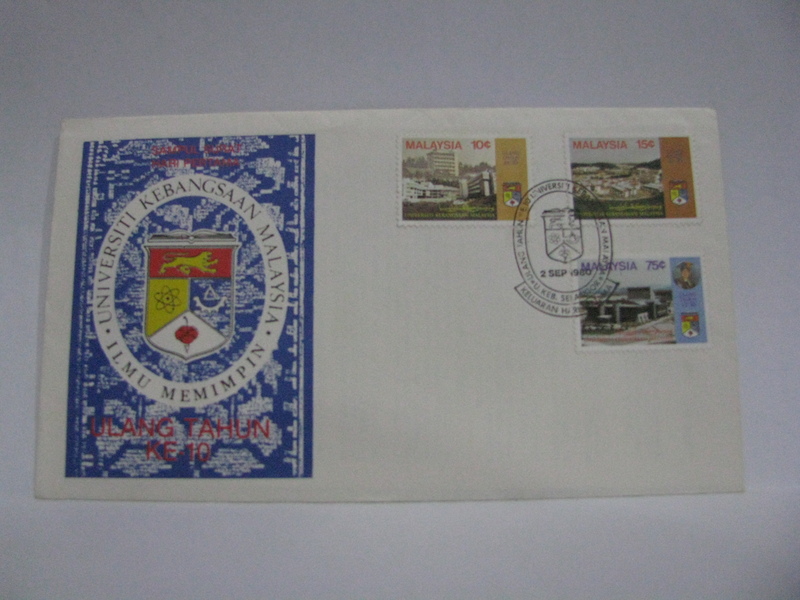 The first of the continuous series of pictorial cancellations was on the 1oth Anniversary of UKM issue on 02 September 1980. 29. The first time that the “philatelic bureau” was on a cancellation is on 09th November 1980 where the word “Biro Setem” was first introduced on the cancellation for the 15th Century of Hijrah issue. However, the word “Biro Setem” only appears on the Kuala Lumpur cancellation. Other state capital cancellations do not have the word “Biro Setem”. 30. 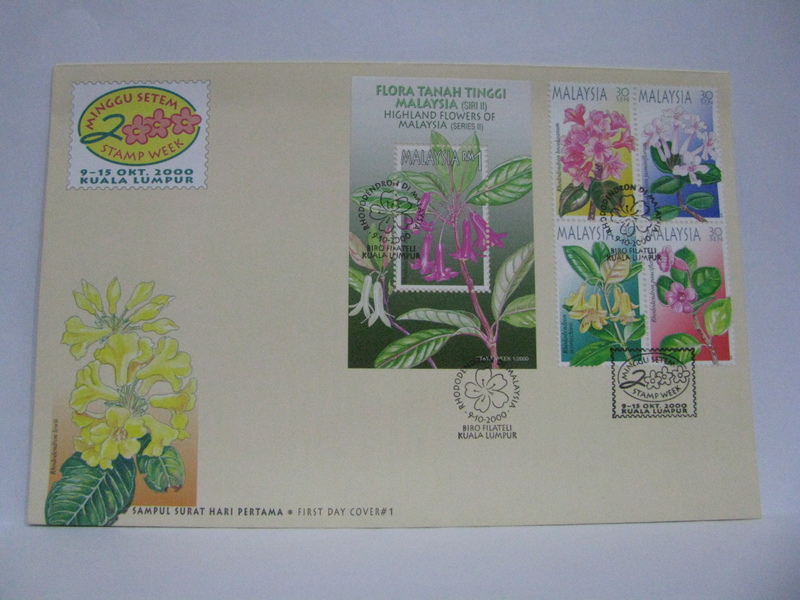 The first Special Issue (non-commemorative) was the Trees of Malaysia issued on 16 December 1981. Prior to this, all the past issues were Commemorative issues. 31. 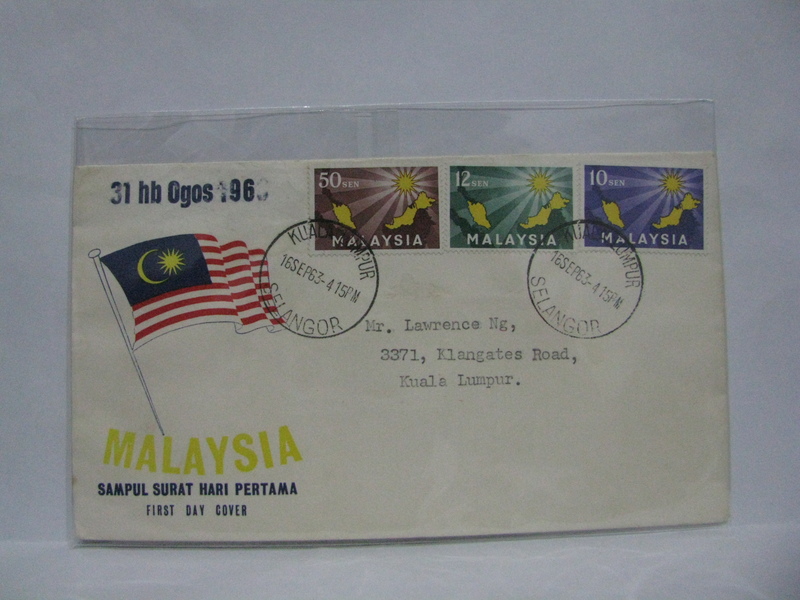 The first miniature sheet was issued on 31 August 1982 for the 25th Anniversary of the Independence Day. 32. 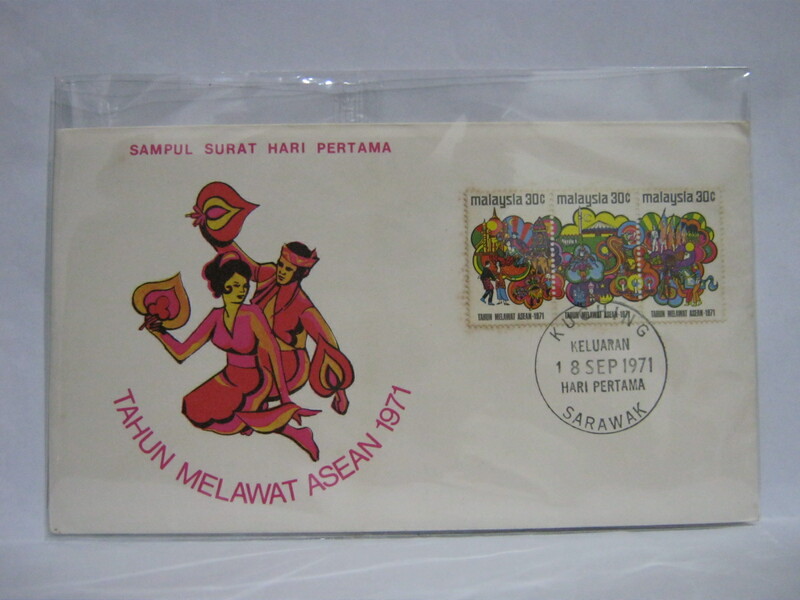 The last pictorial cancellation with the word “Biro Setem” was for the Malaysian Handicraft on 26 November 1982. Again, “Biro Setem” is used only in Kuala Lumpur. 33. The first use of the word “Biro Peminat Setem” on the cancellation was on 22 January 1983 in the Launch of LNG Export from Bintulu. This time the word “Biro Peminat Setem” is used in all the state bureaus. 34. 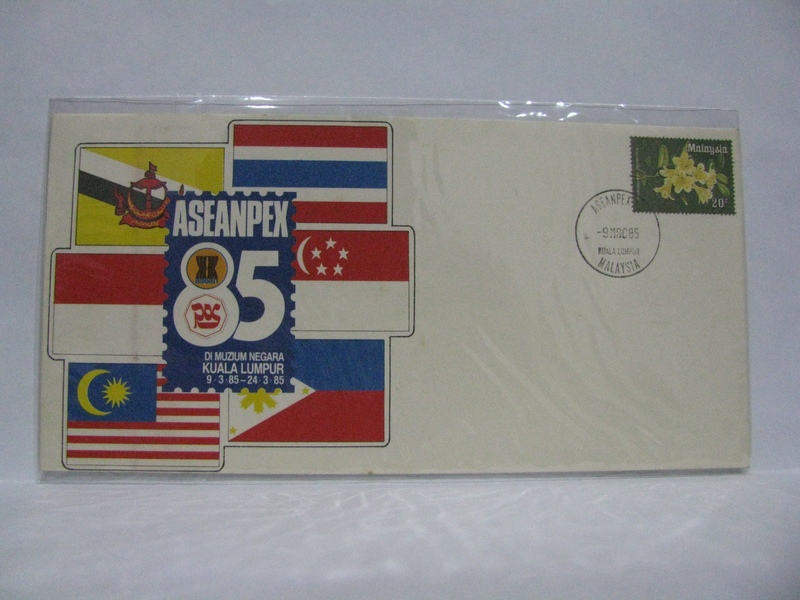 The first pictorial and commemorative Pre-Stamped Envelope (PSE) was issued on 09 March 1985 for ASEANPEX ’85. 35. 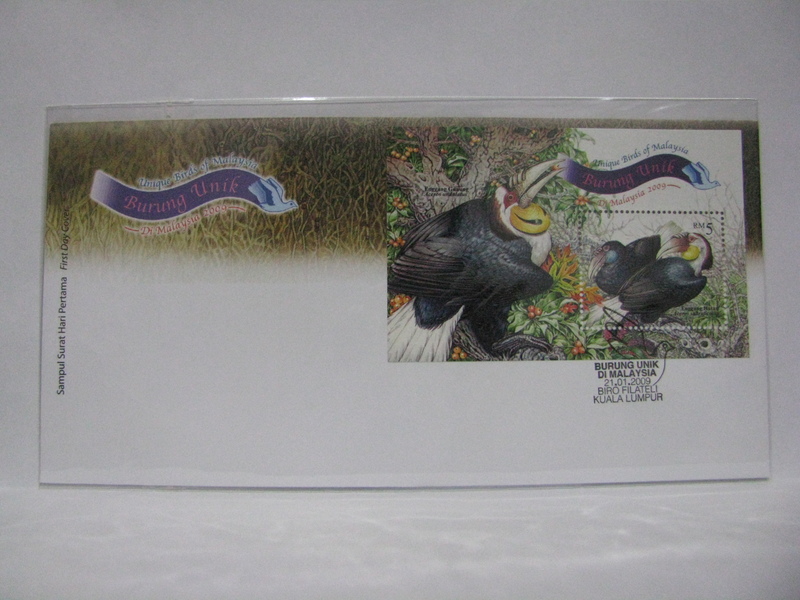 The first serial stamp issue was on the topic of Protected Wildlife issued on 25 April 1985. 36. 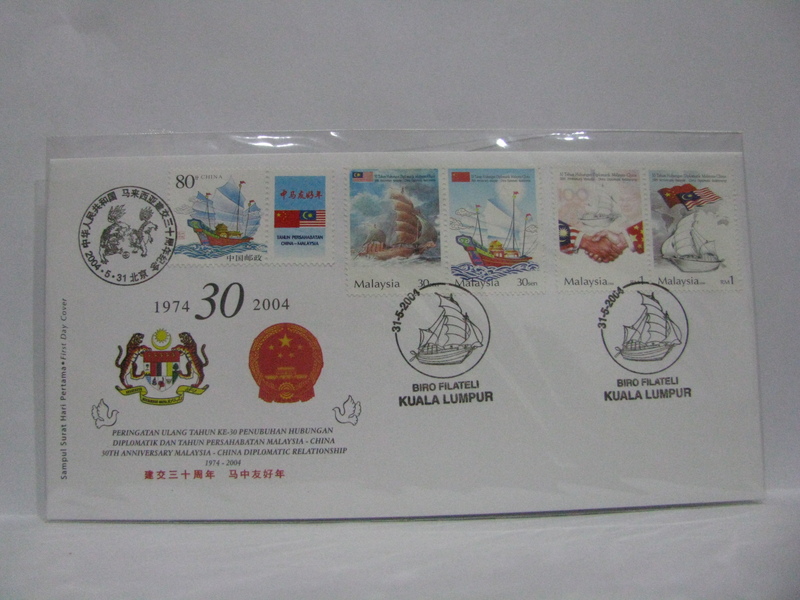 The first miniature sheet with a different design than the stamps was issued on 01 June 1985 for the 100 Years KTM issue. 37. 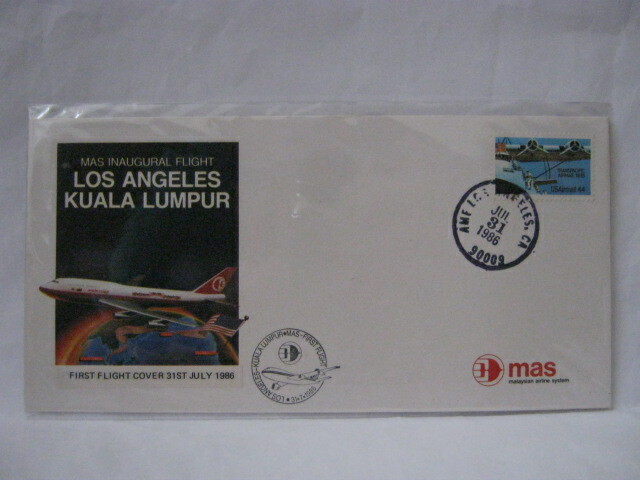 The first official first flight cover was issued on 31 July 1986 for the MAS Inaugural Flight to Los Angeles. 38. 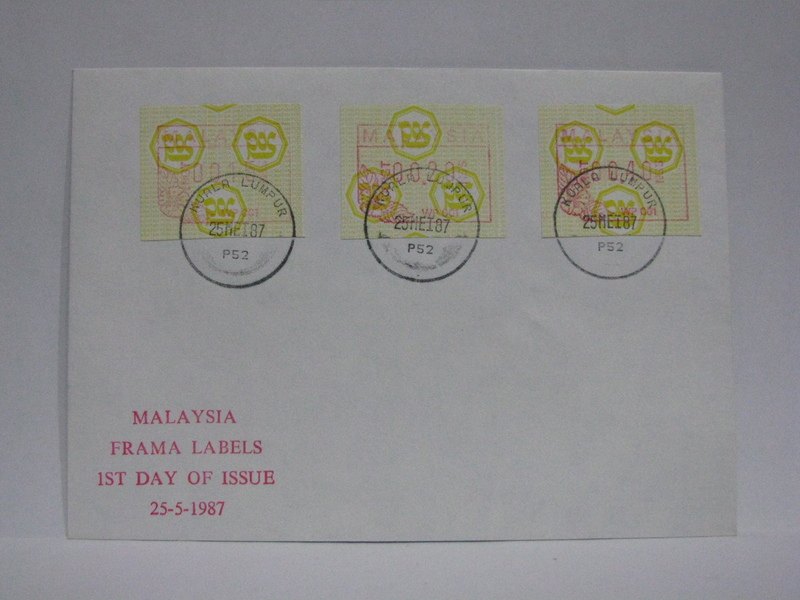 The first frama label was issued on 25th May 1987. 39. 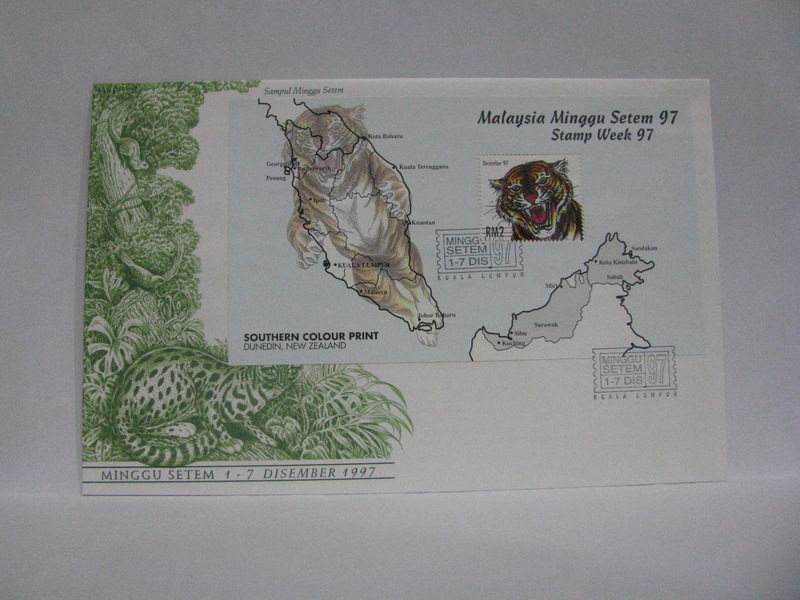 The first official maximum cards were issued on 14 November 1987 for the Protected Wildlife Series 3. 40. 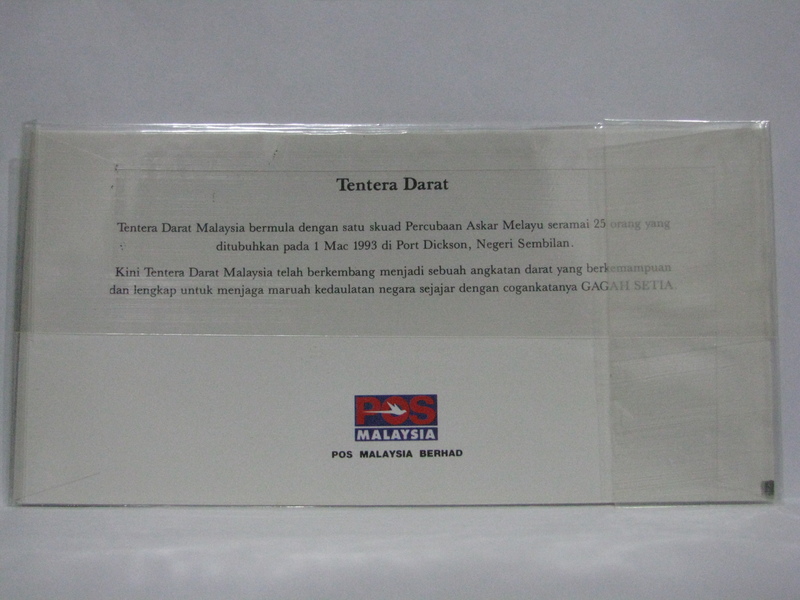 The first presentation pack was issued on 15 April 1989 for the Declaration of Melaka as a Historical City. 41. 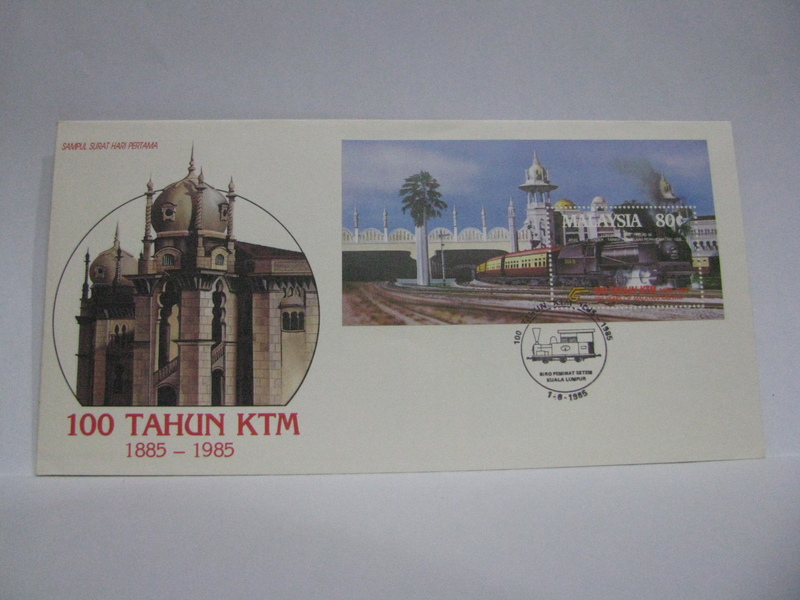 The first pictorial postcard was issued on 02 May 1990 with the image of the Istana Besar Abu Bakar (Johor Royal Museum). 42. 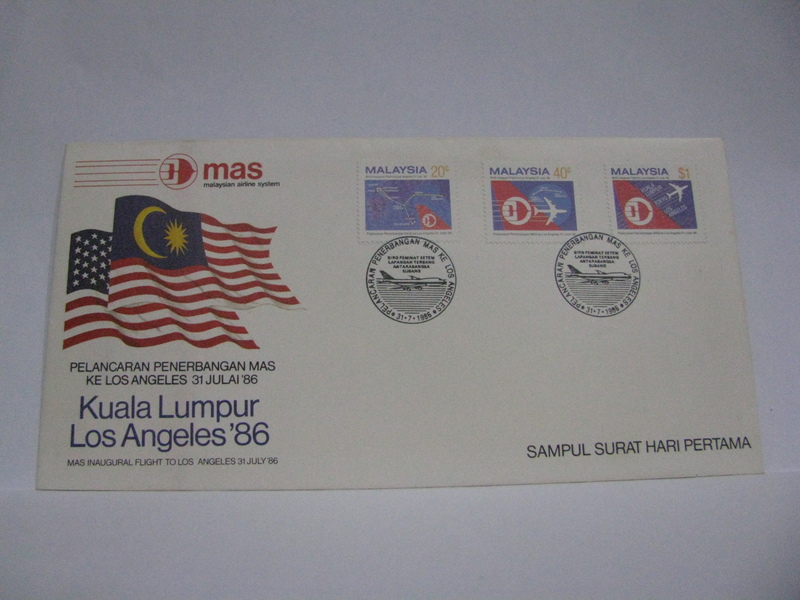 The first Commemorative stamp booklets were issued on 01 July 1992 to promote Kuala Lumpur ’92. 43. 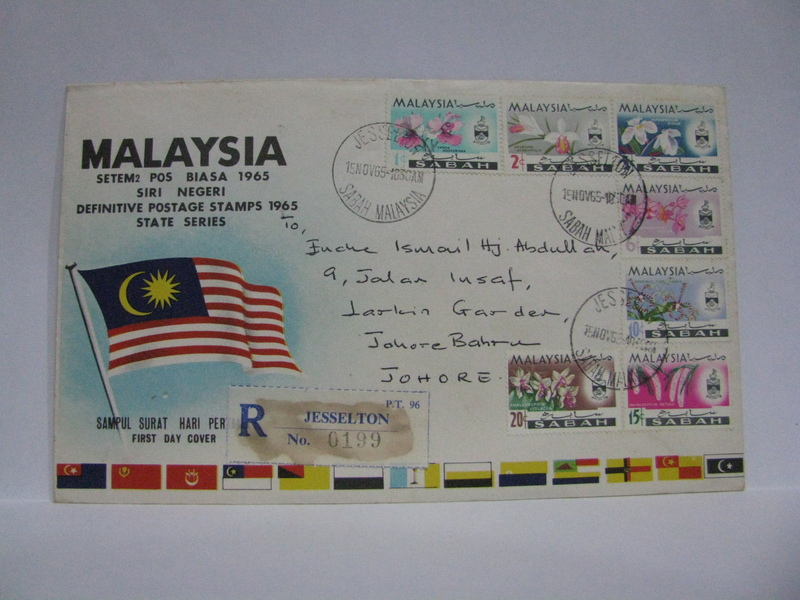 The last use of the word “Biro Peminat Setem” on the cancellation was on 21 December 1992 on the Corals issue. 44. The first error on a commemorative envelope was on 01 March 1993 for 60 Years of the Army. The year of formation should have been 01 March 1933 and not 01 March 1993. 45. The first use of the word “Biro Filateli” on the cancellation was on 24 April 1993 on the 16th Asia-Pacific Dental Congress. 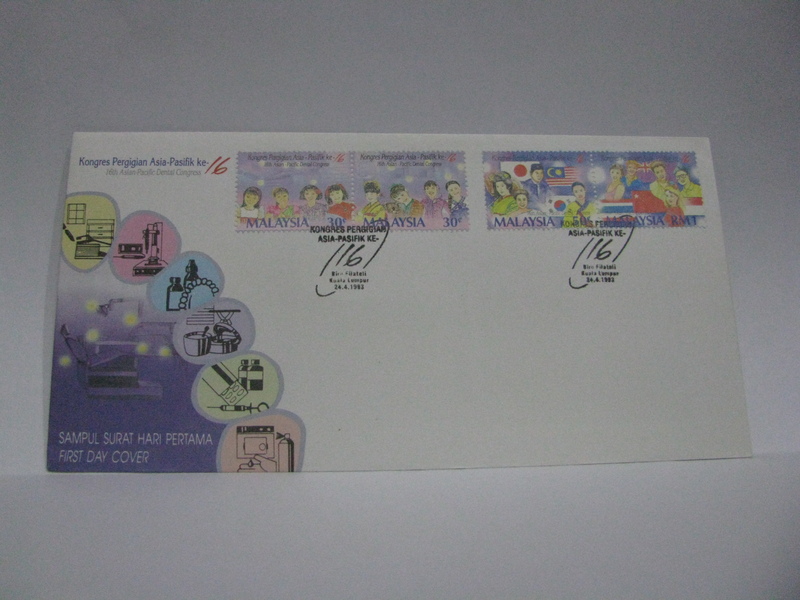 In addition, interestingly, the RM 1 stamp contains an error in the flag representing Chinese Taipei (Taiwan). The flag of the People’s Republic of China was printed instead! This issue is also the first time “RM” was used on the special stamps. 46. The first exhibition overprint was issued on 01 October 1993 for Bangkok 1993. 47. The first unissued stamps was for the 16 August 1994 PHILAKOREA ’94. 48. 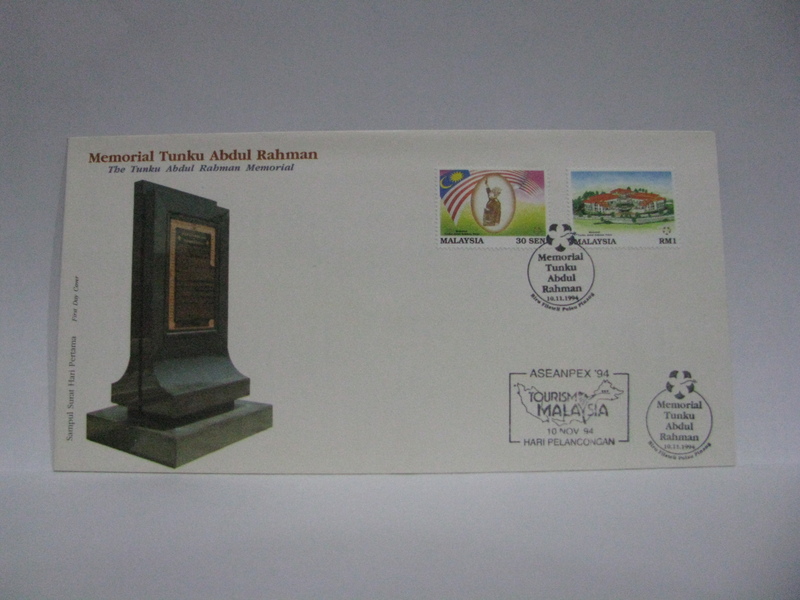 The first use of “sen” on special stamps was on 10 November 1994 for the Tunku Abdul Rahman Memorial. 49. 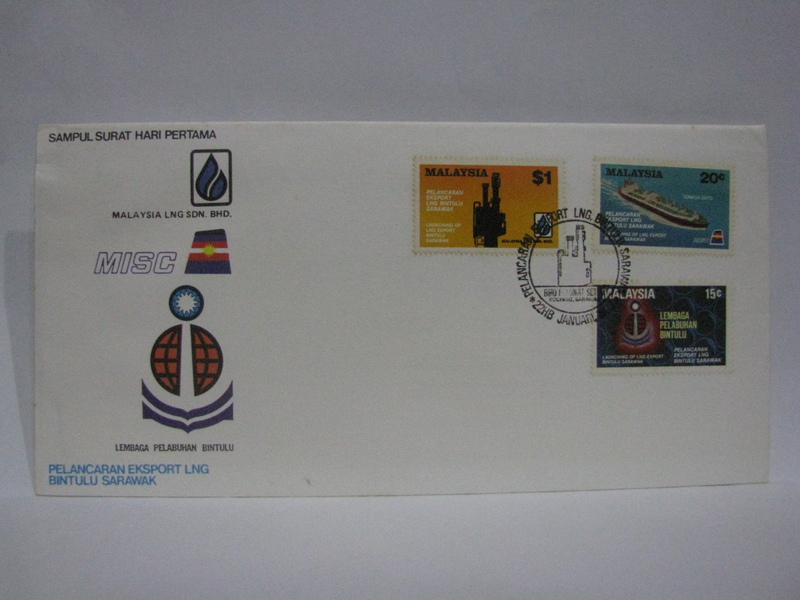 The first Special stamp booklets were issued on 10 April 1995 on The Marine Paradise of Malaysia. 50. 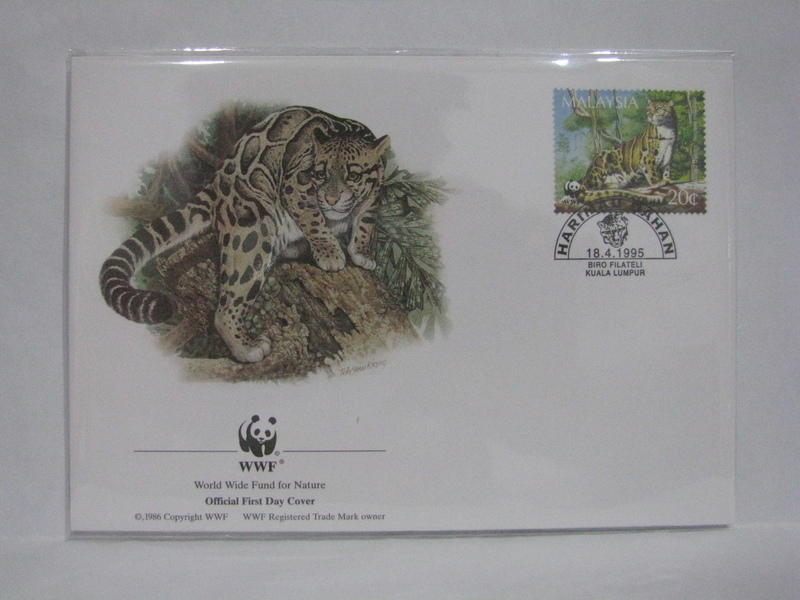 The first World Wildlife Fund WWF issue of Malaysia was on 18 April 1995 on the topic of Clouded Leopard of Malaysia. 51. 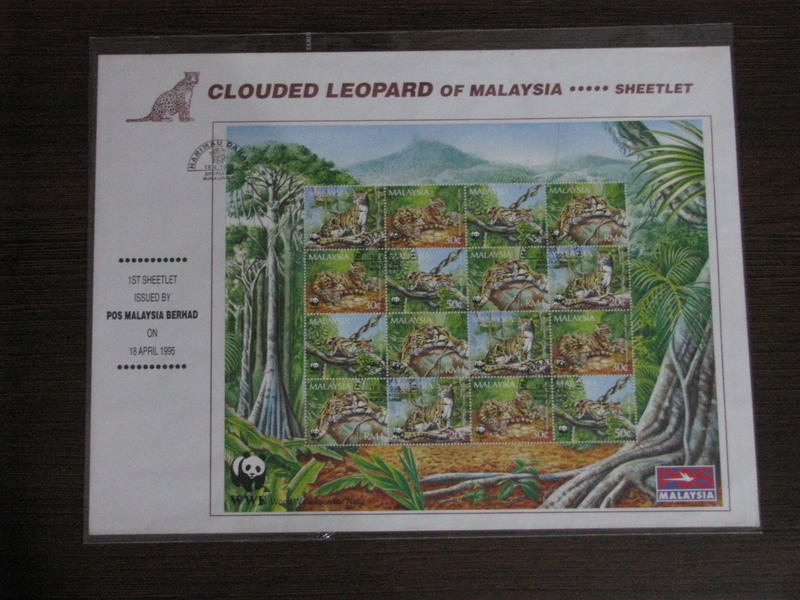 The Clouded Leopard of Malaysia was also the first sheetlet issued in Malaysia. 52. 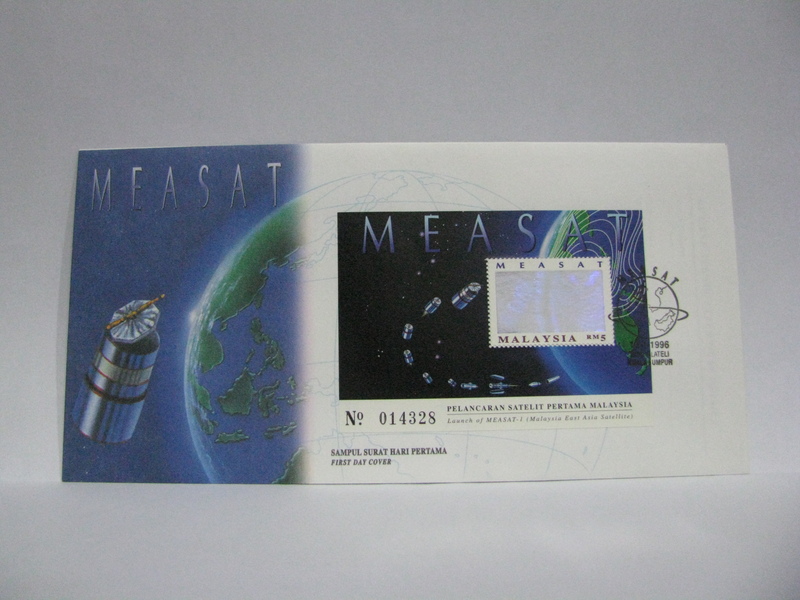 The first special effect (hologram) miniature sheet was issued on 13 January 1996 for the MEASAT issue. Since then there has been far too many “special effects” to catalogue. 53. The first Stamp Week was organised on 02 December 1996. 54. 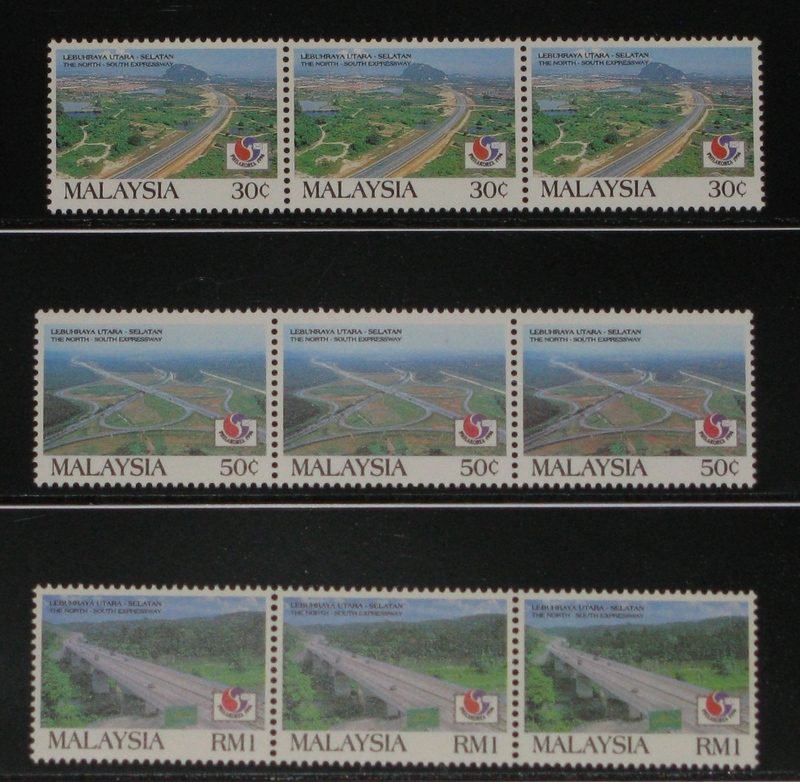 The first “Miniature Sheet only” issue was also for the Stamp Week 1996 issue. 55. 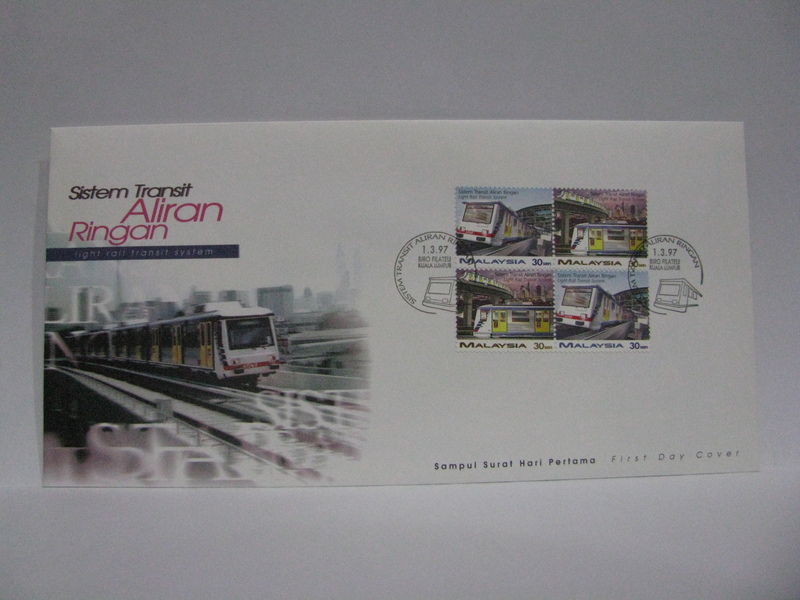 The first booklet First Day Cover was issued on 01 March 1997 for the Light Rail Transit System. 56. 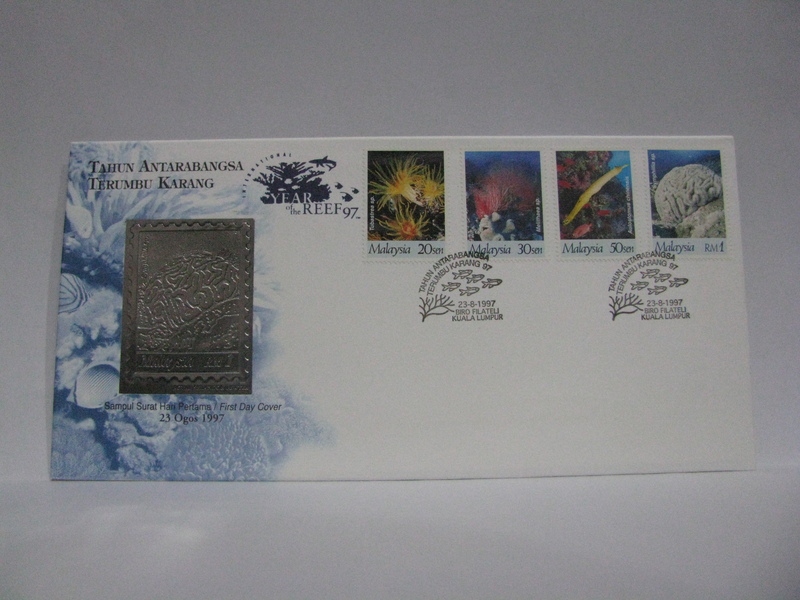 The first Pewter First Day Cover was issued on 23 August 1997 for the International Year of the Reef ’97 issue. 57. The first Cinderella was by Southern Colour Print on 01 December 1997 during Stamp Week ’97. 58. The first Uncut sheet was issued on 28 November 1998 for Stamp Week ’98. 59. 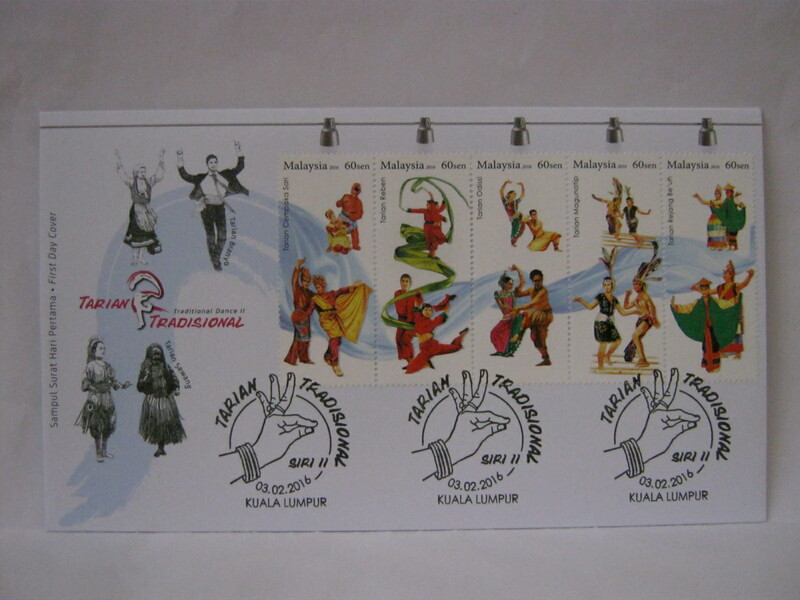 The first imperforate sheet was issued on 24 July 1999 for the P Ramlee issue. 60. 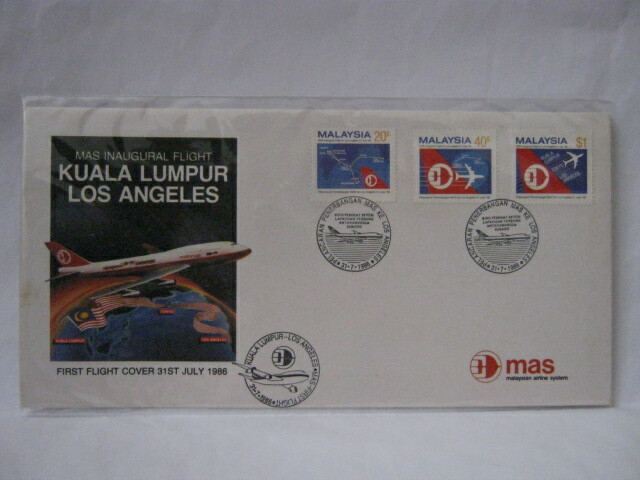 The first imperforate miniature sheet was issued on 30 August 1999 for the Petronas Twin Towers issue. 61. 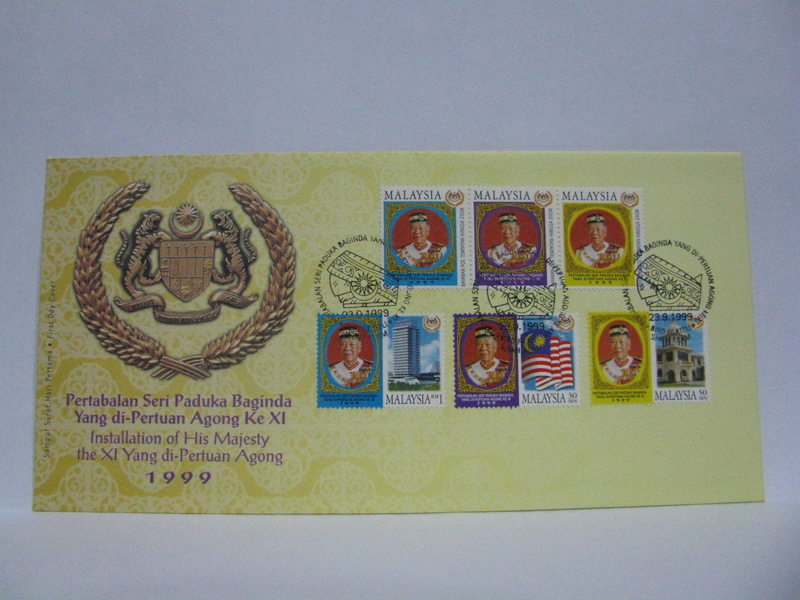 The first No Value Indicator NVI stamps were released on 23 September 1999 for the Installation of His Majesty the XI Yang di-Pertuan Agong issue. 62. 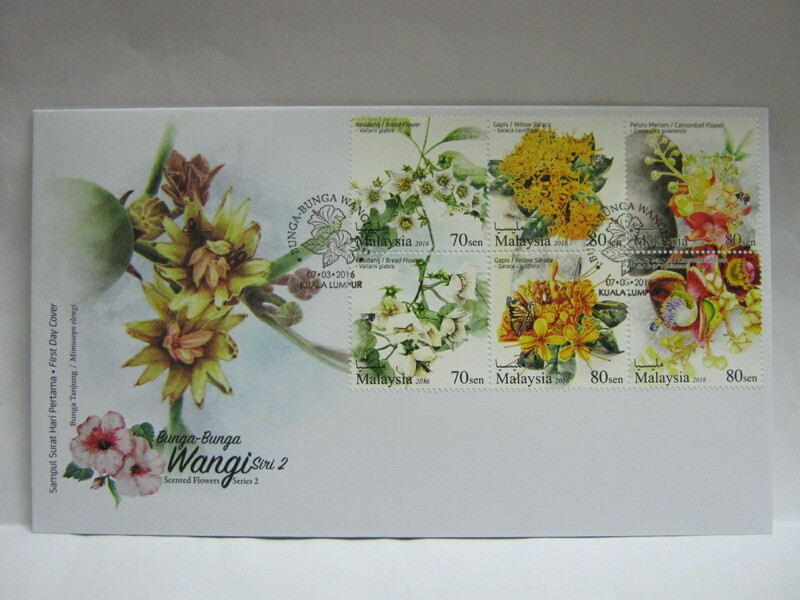 The first time that the year of issue is printed as a reference on a miniature sheet is the Stamp Week 2000 Highland Flowers of Malaysia Series II on 09 October 2000. 63. 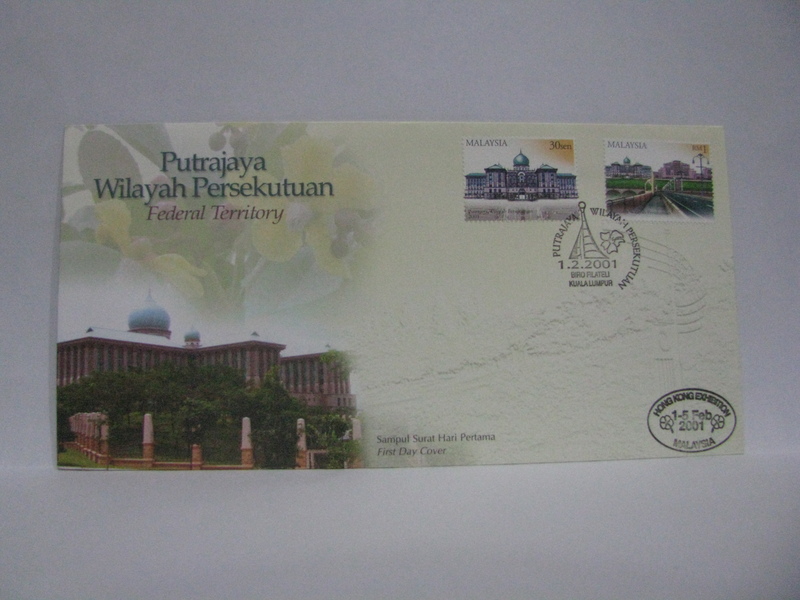 The first time that the year of issue is printed on the stamp is for the Putrajaya Federal Territory on 01 February 2001. 64. 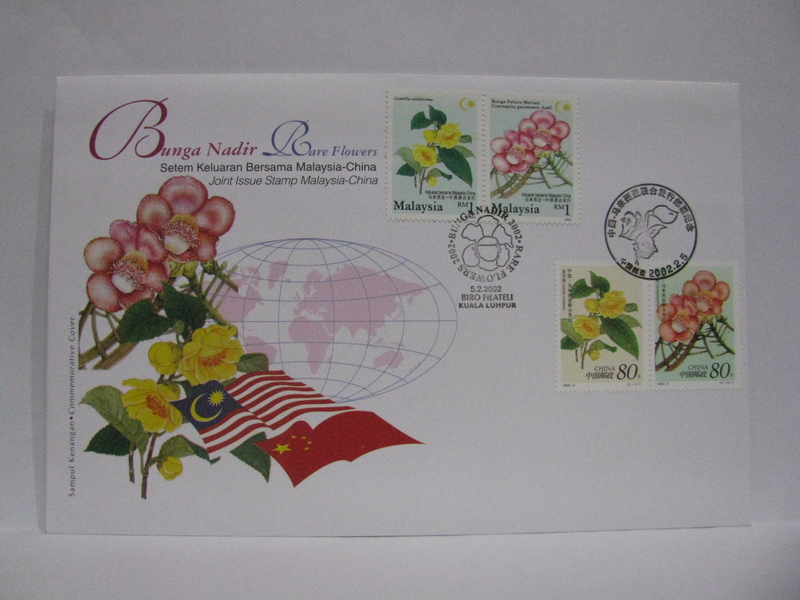 The first joint issue was with China on 05 February 2002 with the topic of Rare Flowers. 65. 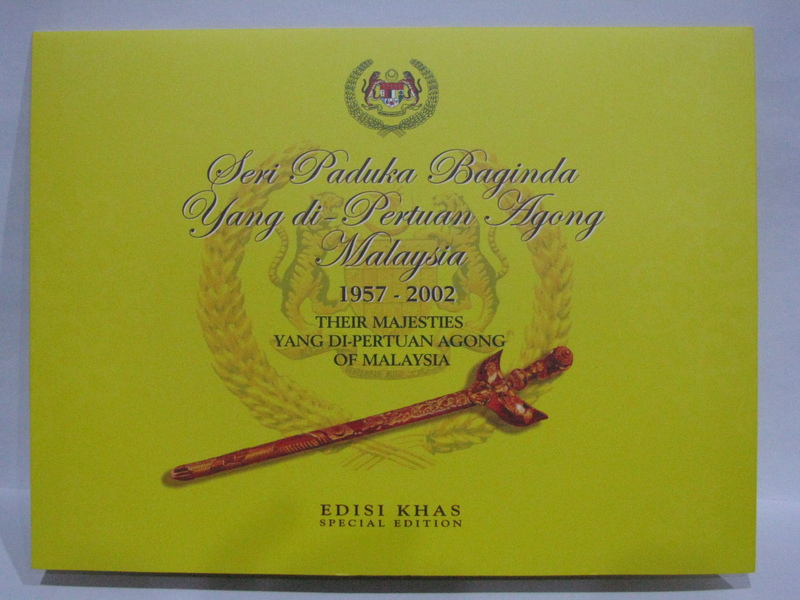 The first DYMM Yang Di-Pertuan Agong sheetlet was issued on 25 April 2002. 66. 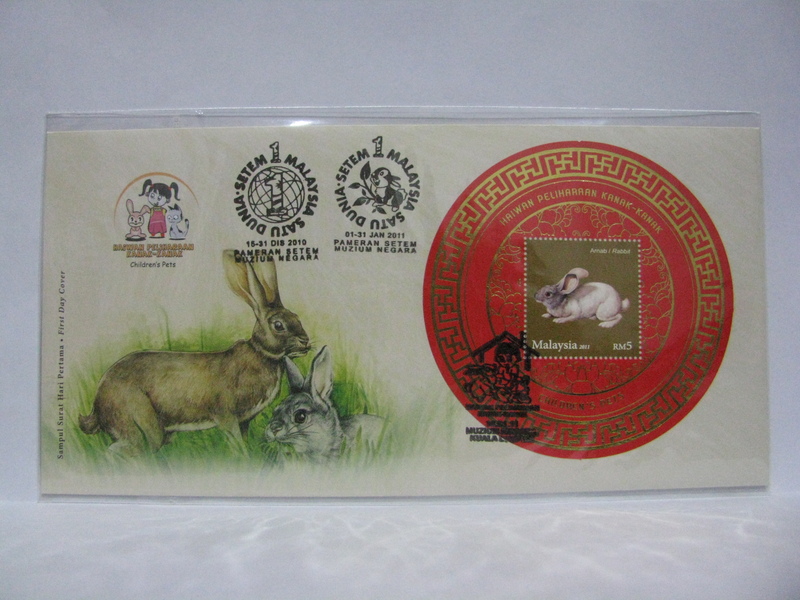 The first Lunar New Year related issue was the Southern Serow issue on 25 January 2003. 67. 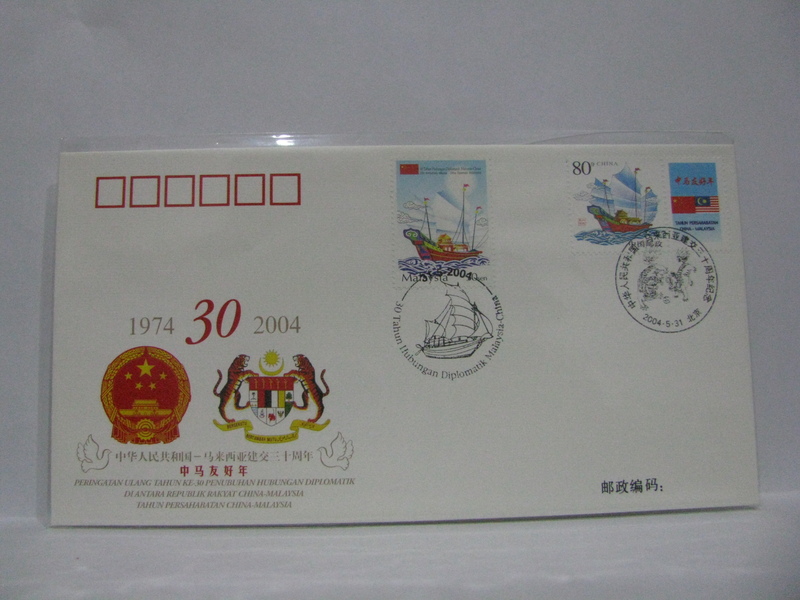 The first joint commemoration issue was on 31 May 2004 for the 30th Anniversary Malaysia – China Relationship 1974 – 2004. This is not a true joint issue. It is more like a joint cancellation for an event. 68. The first booklet error (for a special issue) was on 04 November 2004 for the Traditional Transportation series. Pos Malaysia logo was missing. 69. 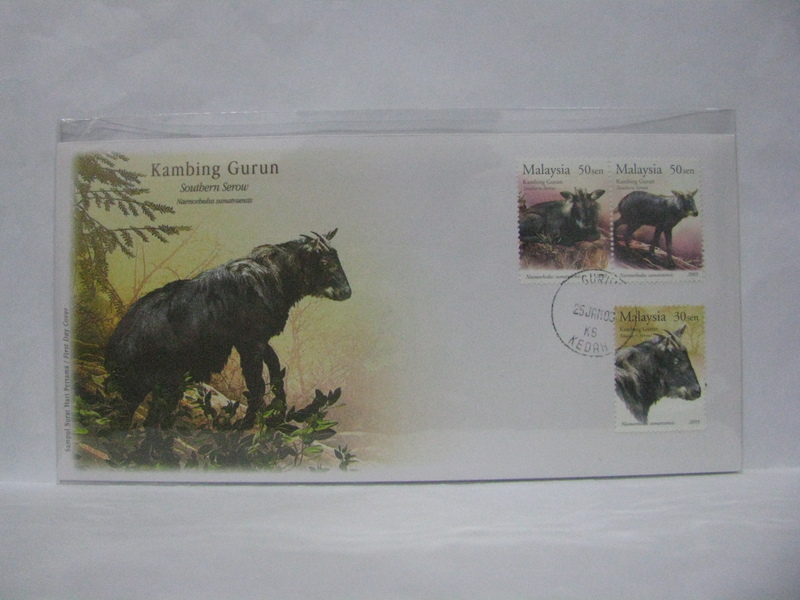 The first Setemku (personalised stamp) was issued on 01 March 2007 in KLCC by the then Kementerian Tenaga, Air dan Komunikasi. 70. The first Omnibus issue was the ASEAN joint issue on 08 August 2007. Well, it is a mini omnibus issue. 71. 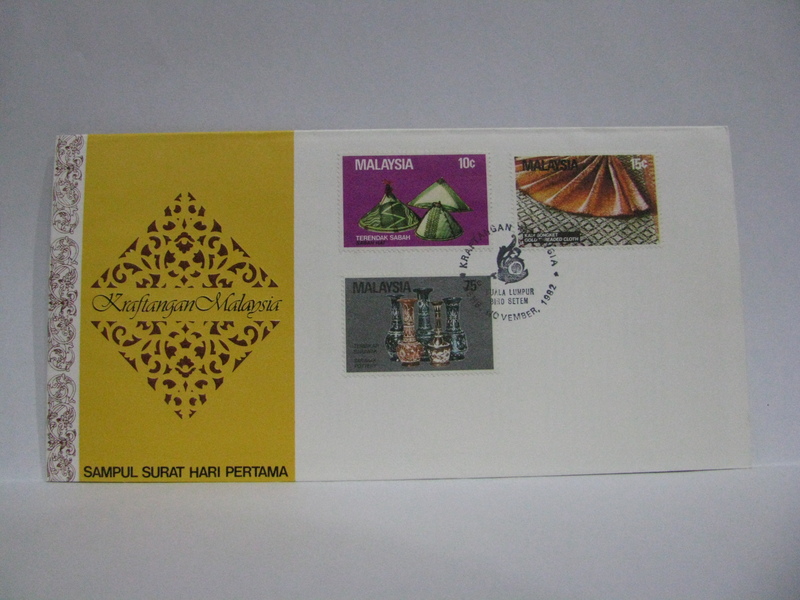 The first fancy shaped miniature sheet was issued on 24 April 2008 for the Butterflies of Malaysia issue. 72. 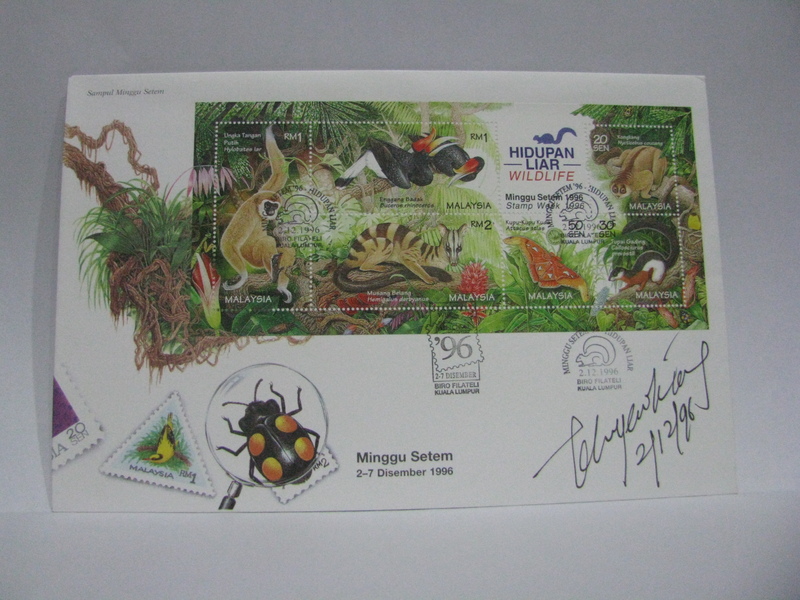 The first stamp without the country’s name was an error on 21 January 2009 on the Unique Birds of Malaysia. 73. 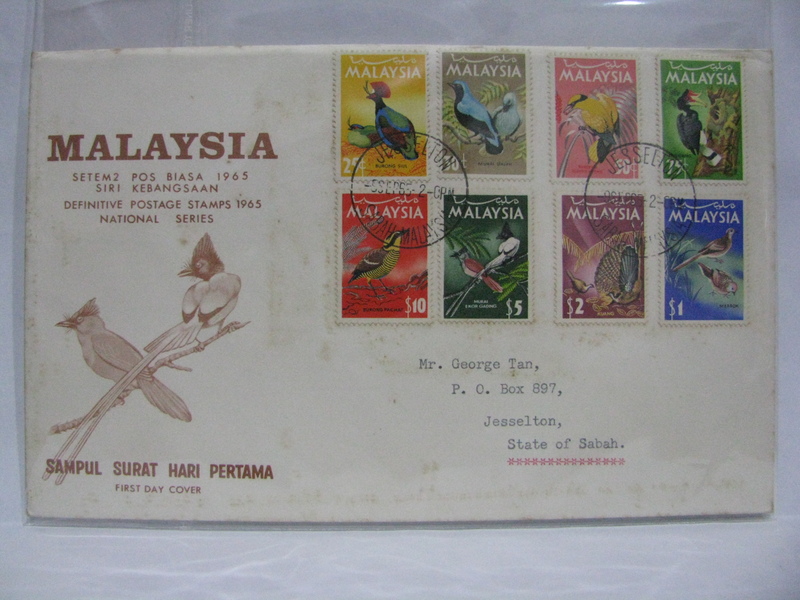 The last presentation pack was also issued for the Unique Birds of Malaysia issue. There has not been any regular issue of presentation packs and it was stopped after 21 January 2009. 74. 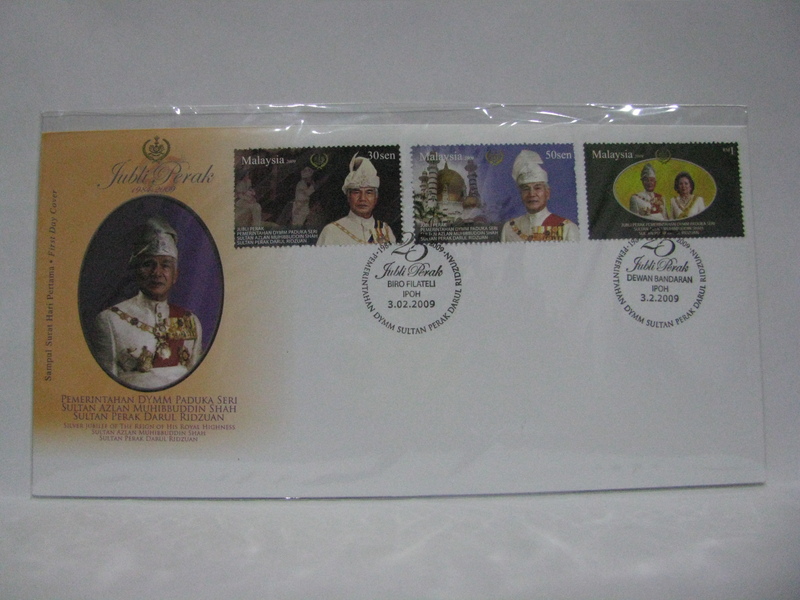 The last use of the word “Biro Filateli” on the cancellation was on 03 February 2009 for the Silver Jubilee of the Sultan of Perak. Since then, the cancellations took just the name of the location. 75. The first continuous Lunar New Year series was restarted on 18 January 2011 with the Children’s Pets issue. Some might argue that it should be 23 February 2010 with the Malaysia – Korea Joint Issue on Tigers. I think it is more of a coincidence for the Malaysia – Korea Joint Issue with “Tigers” as there are no indications or printings related to Lunar New Year on the stamp sheet nor products. 76. The first My Stamp (Setemku) personalised stamp First Day Cover was issued on 28 April 2011. 77. 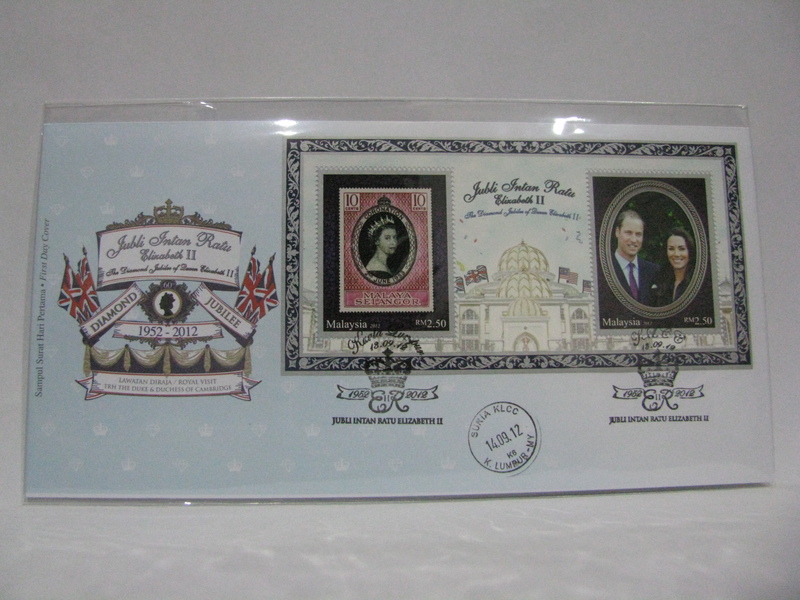 The first time that a British Royalty is featured on a Malaysian stamp issue was on 13 September 2012 to commemorate the Diamond Jubilee of Queen Elizabeth II. 78. 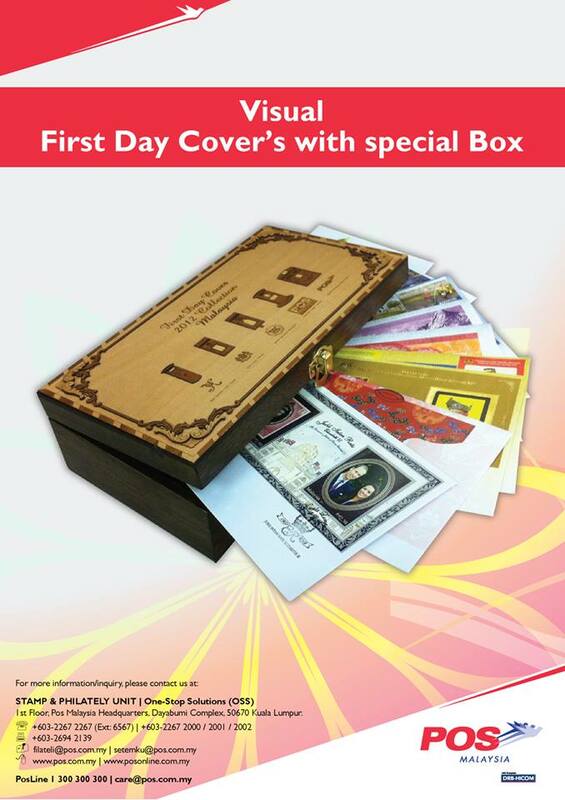 The first First Day Cover Year Set released by Pos Malaysia was in July 2013 for the FDCs issued in 2012. 79. 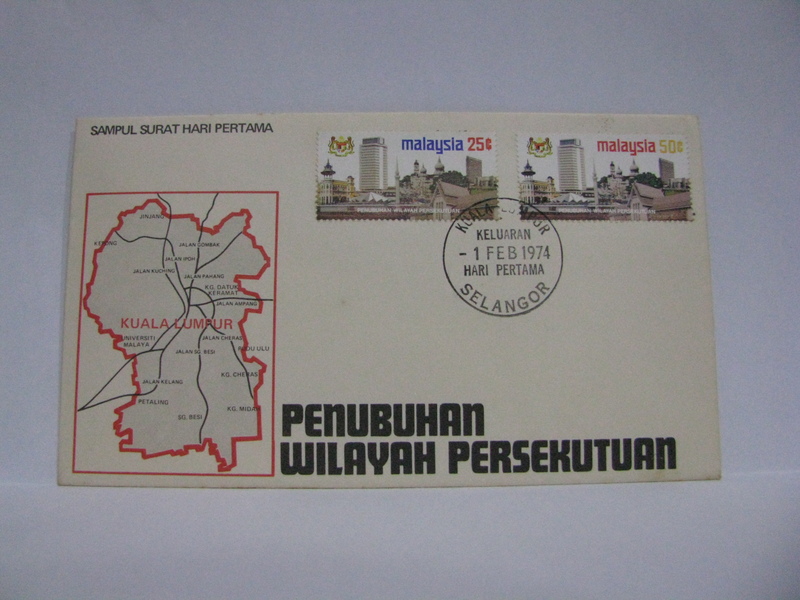 The first Pre-Stamped Envelope (PSE) error was on 26 April 2014 for Obama’s Visit to Malaysia. Pos Malaysia logo was missing. 80. The first use of the revamped Pos Malaysia logo was on 16 February 2015 on the Farm Animals issue products. 81. The last use of the old Pos Malaysia flying dove logo was on 25 February 2015 on the International Coorperative Project on Giant Panda Conservation. This was not surprising as this issue was postponed a few times and the items were probably printed prior to the logo change. 82. 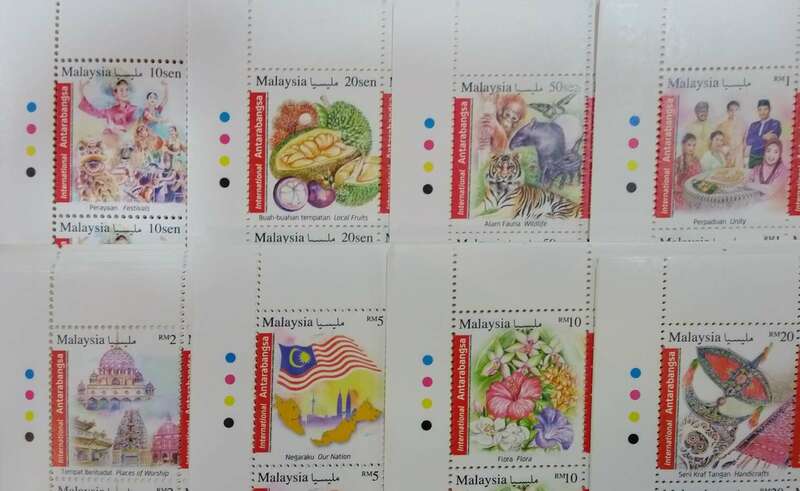 Pos Malaysia first setenant strip of stamps for Standing Order Deposit Account (SODA) members was for the Four Nation Stamp Exhibition on 04 December 2016. 83. The special SODA setenant strip took a break and resumed since the Traditional Dance Series 2 issue on 03 February 2016. 84. The return of the Jawi script for the word Malaysia was on 07 March 2016 for the Scented Flowers Series 2. 85. The first International Definitive Stamps were released on 01 October 2016. This is the regular post office sheets of 100 stamps. There has been more firsts with various special effects. I did not list these as there will be too many special effects to list. I want to thank all of you (KH Chung, KH Ong and Noor Ikhwan and many others) who has given more insights into the “firsts” and the “lasts”. If you have any more interesting information, do share with the other readers.